This line of high performance handheld spectrum analyzers covers the 9 kHz to 43 GHz frequency range. They feature a touch screen user interface, a dynamic range greater than 106 dB, tracking generators that cover 9, 13, and 20 GHz, display modes for daylight visibility, color, monochrome, and night vision, and much more. The MS2720T Series of handheld spectrum analyzers can be used in applications involving spectrum monitoring, hidden signal detection, RF and microwave signal measurements, microwave backhaul testing, and cellular signal measurements. Each analyzer in the series have four available sweep modes: fast, performance, no FFT, and burst detect. 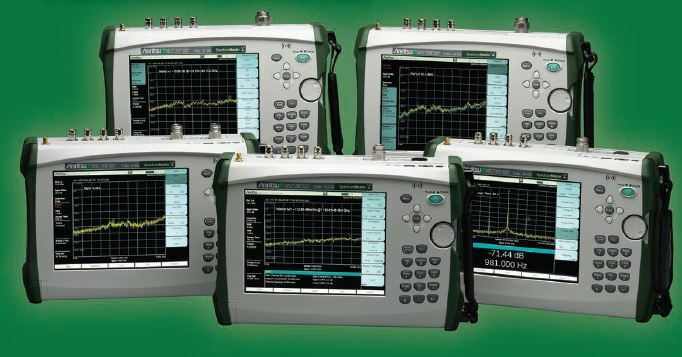 With a resolution bandwidth from 1 Hz to 10 MHz, hysteresis, hold-off, and delay triggering choices, zero-span capabilities (including 10 MHz RBW and VBW), on-screen interface mapping, and LTE measurements with up to 20 MHz bandwidth, these handheld spectrum analyzers truly provide performance that rivals its benchtop counterparts.